There are plenty of reasons to embrace the return of fall with open arms -- from the changing leaves and sweater weather to pumpkin spice mania, apple cider donuts, and flashy new iPhones. For some, the season is even more exciting because it often marks the time of year when McDonald's brings a longtime favorite sandwich back. That's right, it's McRib season, people, and the beloved BBQ-soaked pork patty on a bun is once again on the Mickey D's menu. 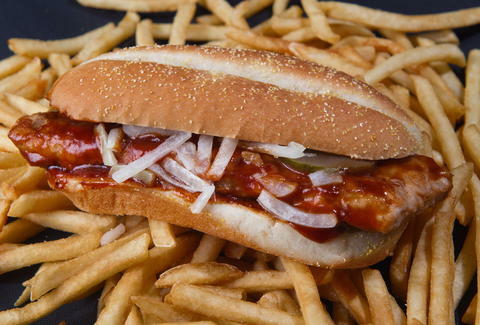 The saucy sandwich, which comes drenched in a tangy BBQ sauce and topped with slivered onions and pickles, made its debut on the McDonald's menu in the early '80s and has only been served periodically by the chain over the last three and a half decades. Over the years, it's amassed such a fervent fanbase that the company actually launched an official McRib Locater app a couple years ago to help people find specific restaurants where it's available. This year, the app will be particularly helpful, because the chain announced the McRib will only be sold in stores where it has previously been a big seller. You'll officially be able to get your hands on one in participating locations starting November 2, though customers in New York, Texas, Oklahoma, Missouri, and New Mexico have already taken to social media to broadcast its return in their area. McDonald's hasn't provided details on its exact availability nationwide, so your best bet besides doing a crawl of every local McDonald's is to fire up the app and take a peek. If you want your fill you'd be wise to act fast, since there's no telling when McDonald's will put them back in the vault until next year.